I can't believe it's been two years since I have packed my bags and took a road trip to San Antonio. Cricket and I are ready! 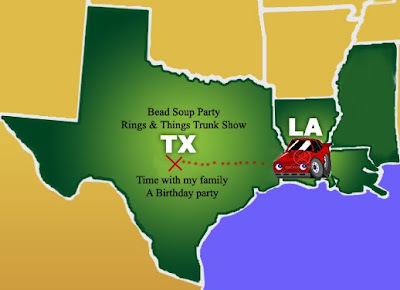 We have a bead soup party planned, lunch and a Ring's & Thing's trunk show. Stay tuned for pictures this week of our adventure. Thanks for stopping by. Have a lovely trip. I know it's gonna be special just because you get to be with family! Have a safe and fun trip, Bev!